Top > Study > Internet shopping > When you have click a purchase button by your mistake? ■ When you have push a purchase button by your mistake? In case of gesture of purchase is equivalent to“error (having been wrong)”is invalidity by Civil law (something like state law in each state) Article 95. However it is said that proviso of Article 95 cannot insist on invalidity when people that expression of intention (the side of a people who buys) has gross negligence. In the case such as Internet shopping, we often click a purchase button by mistake and it can thought that invalidity of gesture by the mistakes is often insisted on. That is to say if buyer insist on “I clicked a purchase button by mistake. 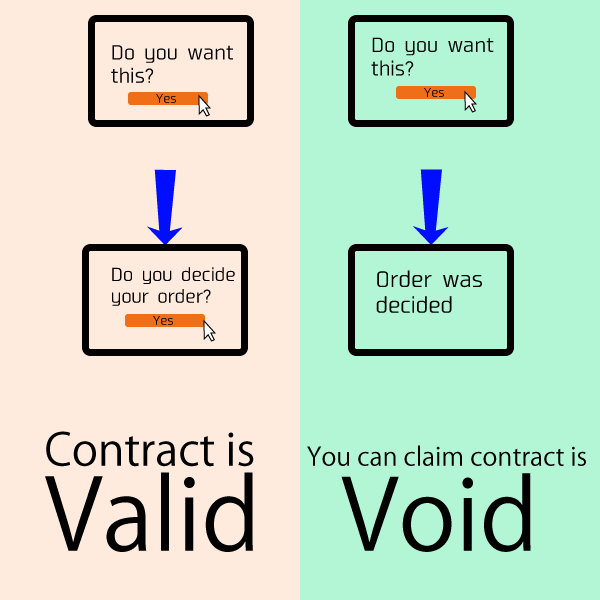 Please invalidate contract“dealer has no choice but to invalidate a contract. Therefore when there isn't a confirmation screen of the contract, we can insist on invalidity if we have“gross negligence”but when there is it the contract is validated by proviso of civil law Article 95. ▲There is a confirmation screen ordinarily but we can insist on a invalidity of the contract that is finished when there isn't it. who committed harm for society. I repeat addition and revision after I am promulgated in 1896.
speaking it before to begin to write a word.